By now, you’ve probably heard about the newest Singapore scheme for small and mid-sized enterprises (SMEs). Called Start Digital, the joint initiative between IMDA and Enterprise Singapore targets new and small SMEs with affordable, easy-to-use digital solutions. These come as subsidised ‘plug and play’ packages, making it easy for SMEs to maximise technology from the start. In the long-run, it also frees them from future digital adoption worries. Personally, I think it’s a smart move by IMDA et. al. For one, the longer you’ve been in business, the harder it becomes to make digital changes. “The feedback from our engagements with SME business owners affirms that many wished they had implemented basic digital solutions at the very nascent stages of their businesses. Secondly, government grants like the Enterprise Development Grant (EDG), or the SMEs Go Digital programme, are sometimes seen as being more suitable for established SMEs – not younger businesses. But with Start Digital’s clear positioning, new or small SMEs can easily get the same ‘leg-up’ to go digital. In fact, some packages even offer the same branded solutions larger SMEs use at just the fraction of the usual price. Like SAP Business One. Or Microsoft Dynamics 365 Business Central. Both are popular enterprise resource planning (ERP) systems used by thousands of SMEs worldwide. 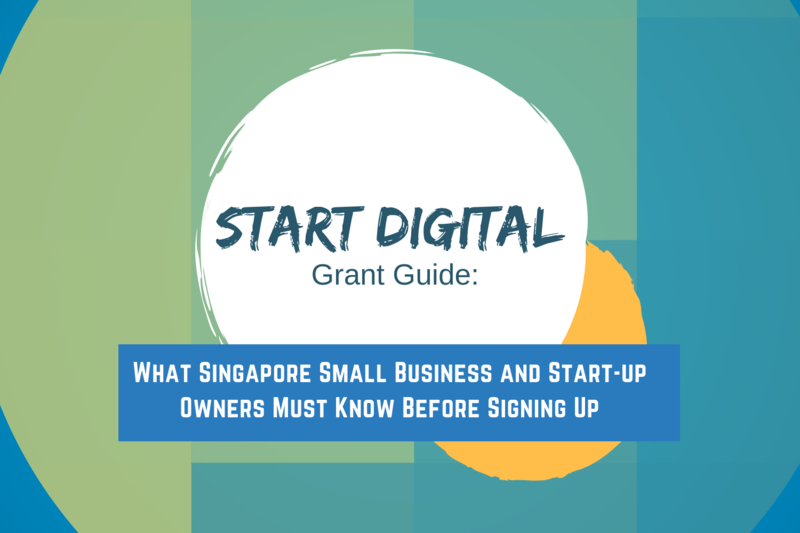 Let’s take a quick look at how this new Singapore government grant initiative meets your small business’ objectives. What Is The Start Digital Initiative? Case study: how going digital benefits smaller businesses. Start Digital’s solutions are developed by software vendors, and offered through intermediary partners like DBS, Maybank, OCBC, Singtel, StarHub, and UOB. These core job functions have been identified as key for new / fledgling SME success. Take accounting for instance. Many entrepreneurs and/or new business owners start businesses to seize opportunities or pursue long-time passions. With half of new Singapore companies failing within the first three years (and racking up debts along the way), owners may feel pressured to double down on sales efforts. After all, the last thing you’d want is to waste time trudging through stacks of Excel sheets and documents. But good accounting processes are essential for seeing your SME’s true financial health beyond initial sales revenue. By having an accounting / ERP software for automation and reporting, you can greatly simplify these processes -- leaving you free to focus on what you do best. Am I supposed to select one or two solutions? Why do Start Digital partners like OCBC or Starhub state applicants are limited to one pack per company? What’s a digital pack anyway? If you’re confused, you’re not alone (so were we!). So we made a quick call to IMDA to clarify what they meant by packs and solutions. Eligible SMEs can apply for two solutions. The solution must be from one of the five categories e.g. you could choose an accounting solution for your back-end processes, and a digital marketing solution for your front processes. These two digital solutions form a Start Digital Pack. 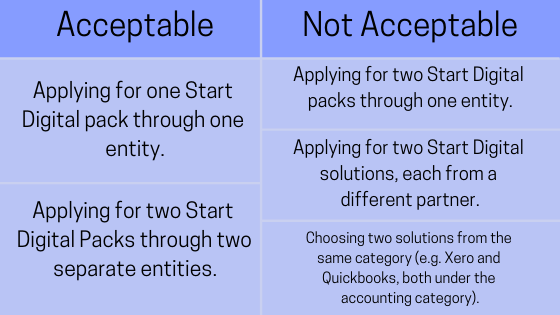 You can only apply for one Start Digital Pack per business entity i.e. unique UEN number. And this pack must comprise two solutions from one Start Digital Partner. You cannot combine two digital solutions from two Start Digital Partners and call it a pack. IMDA's Start Digital Pack: what you can and cannot do. On the positive side, this makes it convenient for applicants as you only apply through one partner. For example, if you’re an OCBC business account holder, you can directly apply for your preferred solutions via their digital business dashboard. On the other hand, this means you’re restricted to choosing among what’s offered by a Start Digital Partner. That’s fine if you’re contented with a Partner’s digital offerings. But if you like the freedom to choose what’s best for your SME, it can be quite a frustrating experience. Whether IMDA will change their position on this later remains to be seen. For a list of Start Digital partners, please click here. 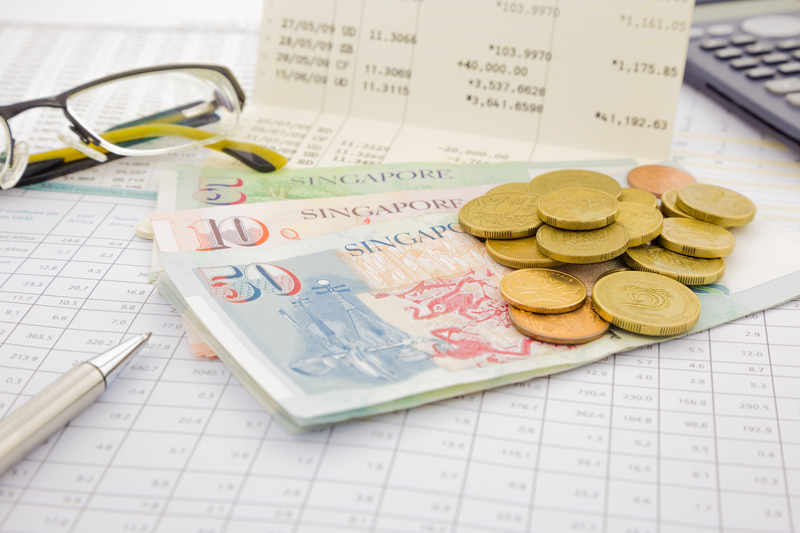 All eligible SMEs will get S$500 to partially off-set your initial costs. Depending on your solutions’ costs and your chosen partner’s terms, this could net you anywhere between six months to a year’s worth of free subscription. For example, OCBC will credit S$500 to business account holders once the applicant purchases two digital solutions through their OCBC digital business dashboard. All the applicant needs to do is submit an email declaring their intention to participate in Start Digital and purchase the solutions within 30 days. Do note that the minimum contract period for Start Digital is 18 months. Does My SME / Start-up Qualify for the Start Digital Initiative? Even though Start Digital was designed to help new and small SMEs, the standard criteria for SME-related grants and programmes apply. That is, businesses with less than 200 employees and $100 million in annual turnover are eligible. Also, Start Digital is open to SMEs of any age – there’re no requirements or limits with regards to minimum number of years in operation. Having said that, we’ve been in the digital productivity space for over two decades. (Fun fact: we just celebrated our 20-year milestone!). We’ve helped hundreds of Singapore SMEs ‘graduate’ smoothly from basic accounting software to modern, integrated ERP systems. Let’s take this fictitious, young Sales & Distribution SME looking for accounting solutions as an example. Start Digital solutions are affordable for a reason. Besides subsidies, some solutions are the ‘lite’ editions of established products. Take UOB’s Micro One for example. It’s a lighter edition of SAP Business One, a midmarket ERP software for SMEs. For most small or new businesses, this is perfectly fine for their needs. However, if you’ve complex requirements, you may want to consider the full SAP Business One version from the start instead. The cost savings from Start Digital over the next two to three years may not be worth the hassle of limited functionalities. That said, scaling upwards to the full SAP Business One version from a ‘lite’ edition is still easier than transitioning straight from Excel spreadsheets. Because part of your subscription fees is waived for six months (in most cases), and you’re paying a subsidised rate for the next 18 months, it can be easy to forget what your digital solutions will cost in the long-run. Before applying for a Start Digital initiative, ask yourself: Can you afford to pay your chosen solutions’ full rates once the grant and subsidies end? Ideally by then, your business should’ve grown to a size where this isn’t an issue. Features aside, it’s also a good idea to evaluate your solutions’ vendors and be sure that they’re reliable enough, with a sizable customer base in Singapore. In short, thanks to the new Start Digital Initiative, you can now digitalise your business at a lower upfront cost, no matter how new it might be. With solutions subsidised and right-sized for smaller businesses like yours, there’s never been a better time to get started.